I go visit the Ringlets at lunch. Today, a story about Henry. He is kind of obsessed about getting into stuff. 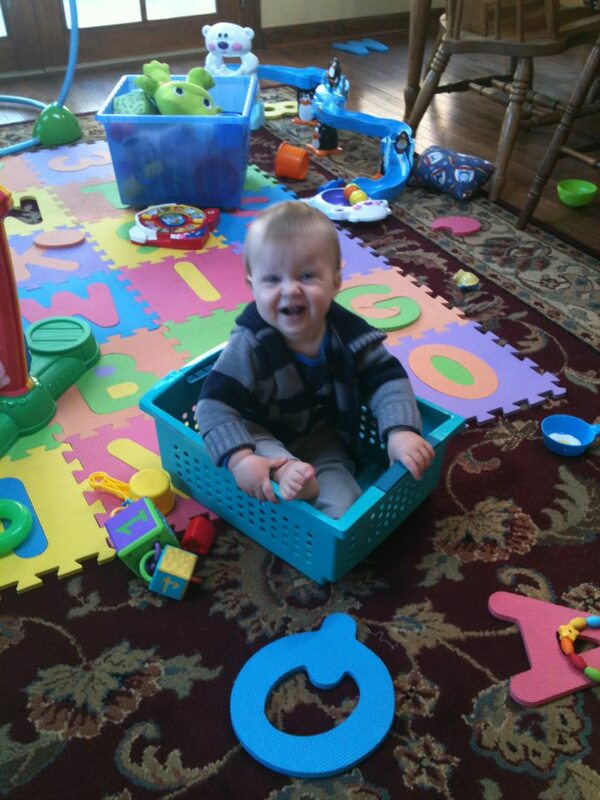 Here’s a recent photo of him in the toy box at my parents. 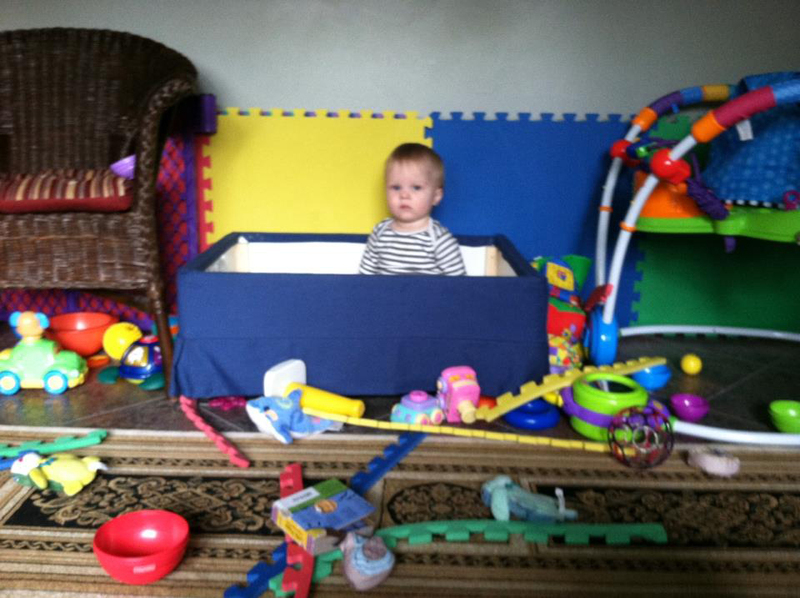 He jettisoned all the toys so he could get in there…and now there are no toys in there. So today at lunch, he had found another box to get into. 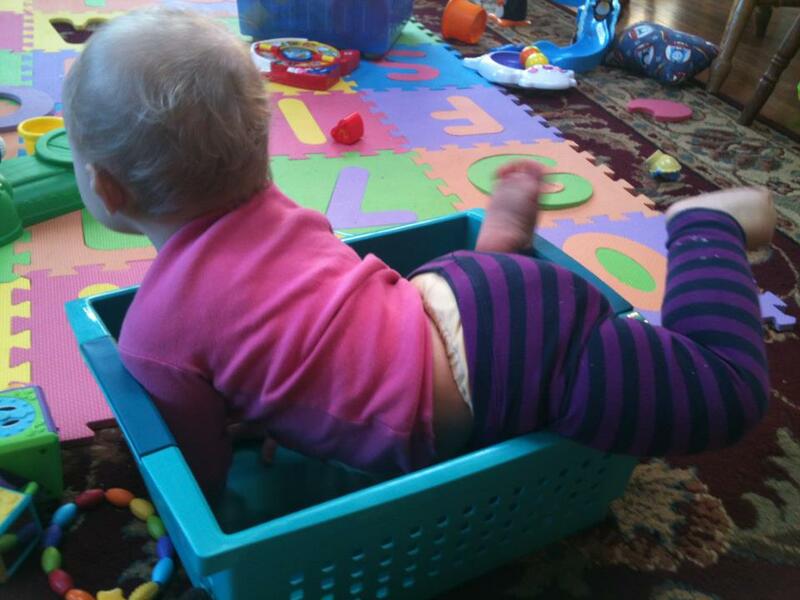 And, quite typically, Eleanor caught sight, and decided to give it a try. Once Eleanor got herself a bit better situated in the tub (with a little help), Henry decided there was probably room for him in there as well, so he invited himself over. 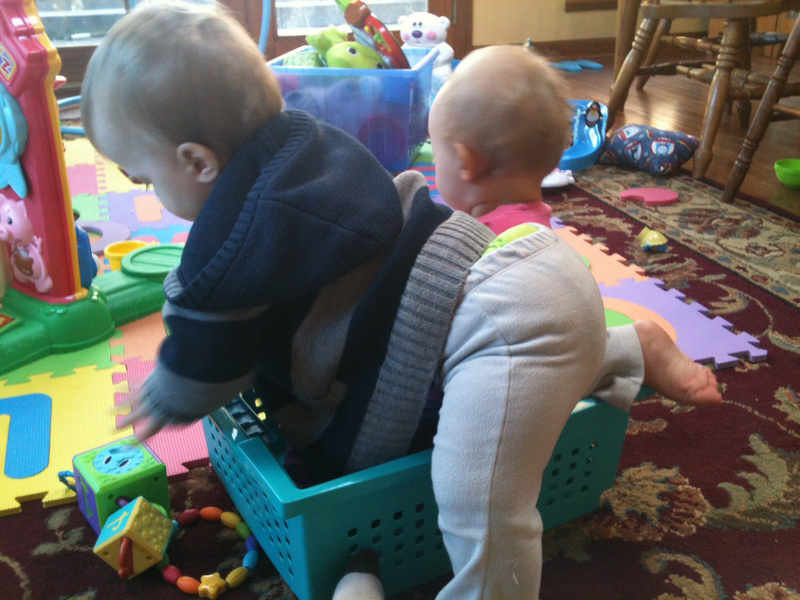 He probably thought he had a bit more room, like in the toy box at my parents, where they do both fit. 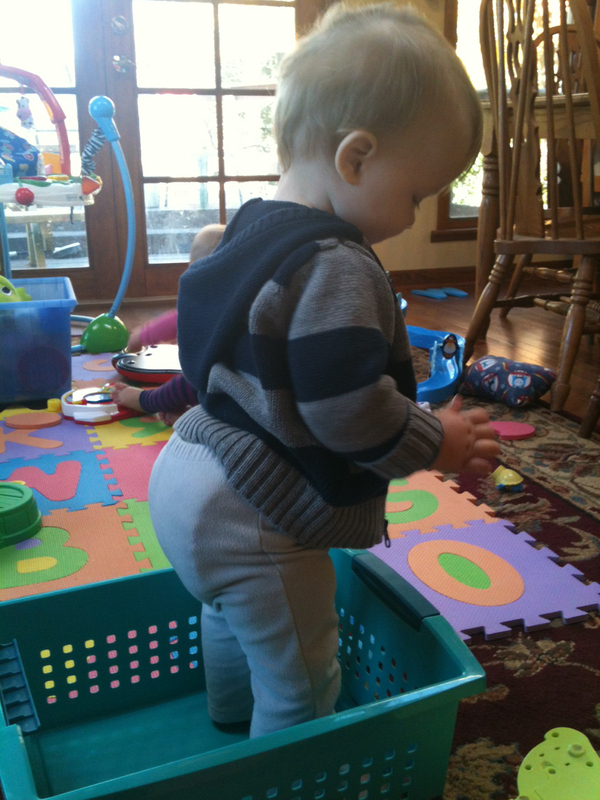 Eleanor, not that interested in being sat on vacated, and Henry celebrated his victory by standing and clapping. This is where the photos stop, because immediately after this, he bit it. Imagine him and the tub rotated clockwise 90 degrees. He pitched headfirst out of that thing so fast (and took the tub with him), that he was definitely more shocked than hurt. In fact, if he hadn’t bonked his nose, I bet he would have loved the thrill of it. So we cuddled for a minute while he regained his dignity. And then something really neat happened. He practiced getting in and out of the tub a bunch of times. Just over and over and over again. Various different ways and with various degrees of success. He wanted to know what had happened, and the best way he could figure it out was to learn how to navigate the tub. 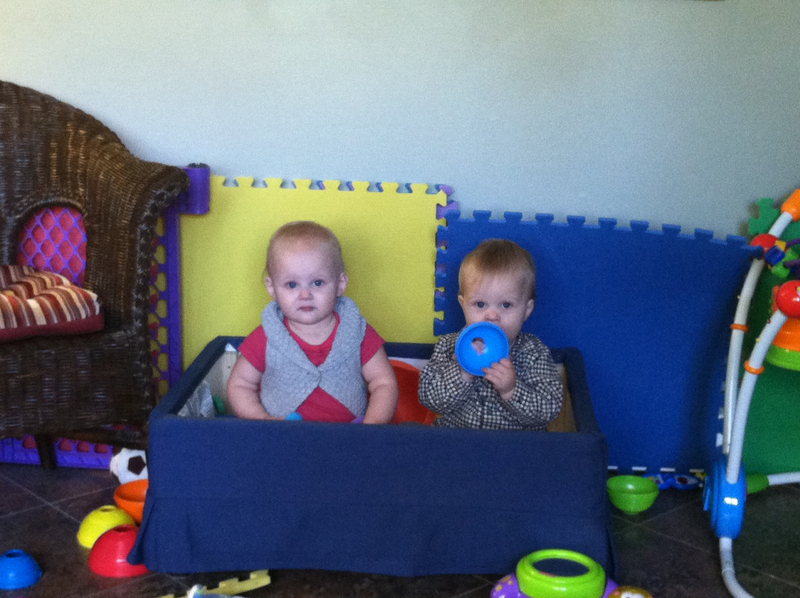 The twins are very different; they’re both very smart (I say that objectively. And so good looking! ), but they go about discovery in completely different way. If something doesn’t work for Eleanor, she is more likely to get easily frustrated and give up – but she’ll come back after a while and work on it; then she’ll go away again; repeat. Until she gets it. Henry will sit and methodically figure something out. He didn’t understand how when he was just standing he could fall so strangely and so he tried to learn more about the tub until he felt safe playing with it again. And I am lucky enough to be part of it. You had left a comment on my blog for testing, so I came to view your site. Ah, baby days. It seems awhile for me. My youngest is five and I still call him my baby, but he doesn’t like that. Children are such fun and it is obvious that you enjoy yours. Oh, my children laughed hysterically at the panda clip. That is cute.